Did you miss your chance to see Ghost Brothers of Darkland County when it played in Atlanta last year? If so, don’t despair. There are a couple of options available that will allow you to experience the show. First, you can order the soundtrack on iTunes or various other places. There’s a one-disc version that has the songs interspersed with select dialog from the play and a 2-disc deluxe set that comes with a trade paperback of the libretto and a DVD containing a Making of Ghost Brothers mini-documentary, featuring in-depth interviews with King, Mellencamp and Burnett along with the digital libretto and other bonus material. Then there’s the 3-disc version that has an additional CD that is just the music (no dialog) and a hardcover version of the libretto. The soundtrack will be available on June 4. Rolling Stone has been featuring individual tracks recently, including one of my favorite songs from the musical, Home Again. On the other hand, maybe you’d rather see the play itself. If so, you may be pleased to hear that the show is going on tour, playing in 20 cities in the Midwest and Southeast beginning October 10 in Bloomington, IN, and ending November 6 in Grand Rapids, MI. Tickets go on sale Friday, May 17 at 10am at aeglive.com. The full list of cities and dates can be found here. June 4 is also publication day for Joyland. Check out issue 70 of Cemetery Dance magazine for my review and an interview with Hard Case Crime publisher Charles Ardai. Thus far the only review has been from Publishers Weekly, and it’s a good one. The audiobook will be narrated by Michael Kelly. Last week it was announced that Tate Taylor (The Help) has optioned the film rights. Cemetery Dance has revealed some of Vincent Chong’s spectacular artwork for their limited edition of Doctor Sleep here and here. A Dollar Baby Film Festival will be part of Comicpalooza in Houston on the Memorial Day weekend. Twenty of these short films will be screened. I will be attending as a special guest. Shawn S. Lealos is hosting the event, screening his adaptation of “I Know What You Need” and promoting his upcoming book Dollar Deal: The Stories of the Dollar Baby Filmmakers. The film adaptation of A Good Marriage is getting in gear. Filming will start in Sleepy Hollow, New York. Joan Allen and Anthony LaPaglia star as husband and wife, with Kristen Connolly playing their daughter. Stephen Lang plays a retired investigator from the Maine Attorney General’s office who is obsessed with solving a crime. Peter Askin is directing from King’s screenplay. Only six more weeks until the premiere of Under the Dome, the summer series on CBS. 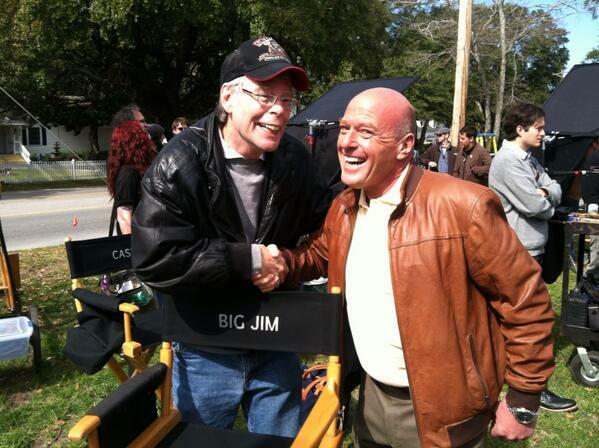 Dean Norris (Breaking Bad), who plays Big Jim Rennie, tweeted a picture from the set with King recently. Cast members and producers discussed the series recently at Wondercon. You can see video of that panel at the bottom of this page. It’s hard to turn on ABC these days without seeing a promo for the show, but just in case you’ve missed them, here’s the latest teaser trailer. Be on the lookout for a shout-out to The Simpsons when the show airs. The plan is for this to be an ongoing series rather than a limited miniseries. JJ Abrams has stepped in with a proposal to turn 11/22/63 into a TV series after Jonathan Demme recused himself from the project. Season 4 of Haven began production recently. Eureka’s Colin Ferguson joins the cast as (what else?) a mysterious stranger. The Dark Tower comics from Marvel are nearing the end of their run. The second issue of Evil Ground, the prequel to The Little Sisters of Eluria, comes out this month. Then, in July, a one-shot called So Fell Lord Perth ends the series. Could the Dark Tower adaptation find its way to Netflix? Chief Creative Officer Ted Sarandos has revealed that he has talked to Ron Howard about the possibility. He says that he and Howard plan to continue their discussions after Arrested Development is finished. Hard Listening is a forthcoming e-book by members of the Rock Bottom Remainders. It is a collection of essays, stories, musings, group email exchanges, candid conversations, compromising photographs, and audio and video (semi-musical) clips, as well as interactive quizzes. It will feature a new King story, as well as stories by some of his collaborators written to imitate him. On July 18, King will appear at The Bushnell in Hartford, Connecticut, in conversation with WNPR radio personality Colin McEnroe. Proceeds from the event benefit the continuing educational and preservation activities of The Mark Twain House & Museum. He and son Owen will headline the PEN Canada annual benefit on October 24. The Q&A discussion will be moderated by the award-winning mystery writer, Louise Penny. Want to blow your mind? Check out this flowchart of The Stephen King Universe. You may think you’ve seen it before, but it was recently updated to include the Dark Tower series. Tonight’s the night for “A Toast to Stephen King,” featuring Margaret Atwood, Clive Barker and George Stroumboulopoulos. The event takes place at 7:30 p.m. in John Bassett Theatre, 255 Front St. W., Toronto. King is presigning a limited number of books for the event, but there’s been no word yet about how they will be distributed. He will not be signing any other books. The issue of Esquire featuring the new, long story “The Gingerbread Girl” is starting to show up in stores. Angelina Jolie is on the cover. “The Gingerbread Girl” takes up over 20 pages of the issue. Blaze comes out on Tuesday. Scribner has launched a web site for the book and the first media review appeared in the L.A. Times. The NY Times reviewed last week’s Rock Bottom Remainders concert. Rock On, But Hang Onto Your Literary Gigs. There’s video from their Good Morning America appearance on the ABC web site. Check out my message board for a summary of what King has to say about his upcoming novel Duma Key during his recent interview with Hardcase Crime’s Charles Ardai. Eli Roth has been talking about Cell quite a bit lately, including at Ain’t It Cool News. You didn’t forget to pick up issue #5 of The Gunslinger Born this week, did you? For the first time in many years, Stephen King will be playing with the Rock Bottom Remainders again. The show takes place on Friday, June 1st at Webster Hall in New York City. The show is being billed as their 15th anniversary “Still Younger Than Keith” concert. Other band members and guests include Dave Barry, Amy Tan, Ridley Pearson, Scott Turow, Mitch Albom, Frank McCourt, Andy Borowitz and Roger McGuinn from the Byrds. The concert is a benefit for 826NYC, the New York affiliate of the organization Dave Eggers founded to get kids writing; the AAP’s Get Caught Reading program; and the American Booksellers Foundation for Free Expression. On May 31, some of the RBR band members will be appearing on Good Morning America to talk up the charities the band is supporting. Among those paying tribute to King at the gala in Toronto on June 8th will be Margaret Atwood and Clive Barker, and former Spin editor Chuck Klosterman is handling the evening’s on-stage interview. The Publishers Weekly review of Blaze is now up at Amazon. The Booklist review is available at Lilja’s Library. Publication date is June 12th. The King-edited 2007 Best American Short Stories is now up for pre-order at Amazon. It features 20 stories selected from over 400 King read last year, along with a list of 100 others worthy of mention that didn’t make the final cut. On July 28, The Stand by Me Celebration and Rolling Roadshow invites fans to re-live the classic coming-of-age film in Brownsville, Oregon where it was filmed. Fans can re-live the film during a 1-day celebration that includes viewing the film on a giant outdoor screen, a blueberry pie eating contest, 1950s vintage car cruise-in, sock hop, and a scavenger hunt for the dead body. There will be guest appearances by cast members. Issue 5 of The Gunslinger Born comes out on June 6th. Lilja has the sketch and variant covers on his web site. The Dead Zone launches its sixth season on USA Network Sunday, June 17 at 10:00PM/9:00 Central.